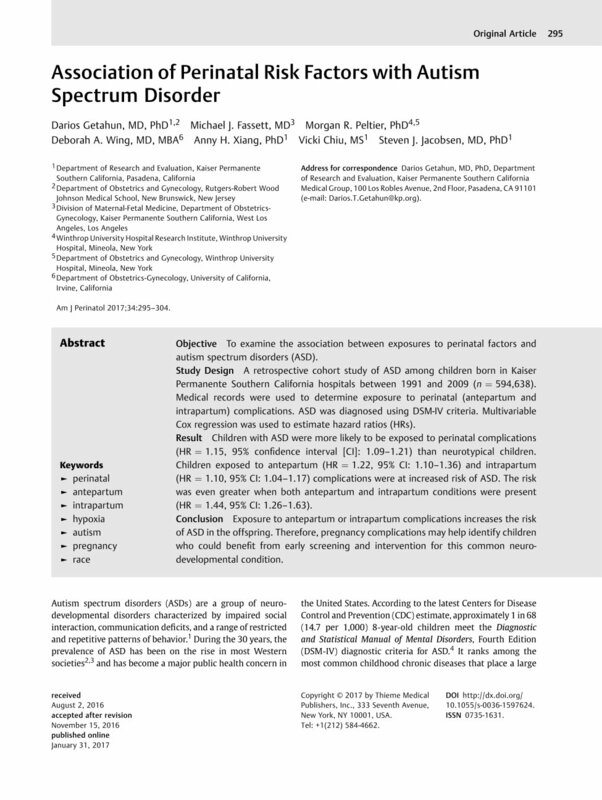 Objective To examine the association between exposures to perinatal factors and autism spectrum disorders (ASD). Study Design A retrospective cohort study of ASD among children born in Kaiser Permanente Southern California hospitals between 1991 and 2009 (n = 594,638). Medical records were used to determine exposure to perinatal (antepartum and intrapartum) complications. ASD was diagnosed using DSM-IV criteria. Multivariable Cox regression was used to estimate hazard ratios (HRs). Result Children with ASD were more likely to be exposed to perinatal complications (HR = 1.15, 95% confidence interval [CI]: 1.09–1.21) than neurotypical children. Children exposed to antepartum (HR = 1.22, 95% CI: 1.10–1.36) and intrapartum (HR = 1.10, 95% CI: 1.04–1.17) complications were at increased risk of ASD. The risk was even greater when both antepartum and intrapartum conditions were present (HR = 1.44, 95% CI: 1.26–1.63). Conclusion Exposure to antepartum or intrapartum complications increases the risk of ASD in the offspring. Therefore, pregnancy complications may help identify children who could benefit from early screening and intervention for this common neurodevelopmental condition. This study is supported by Kaiser Permanente Direct Community Benefit Funds. The opinions expressed are solely the responsibility of the authors and do not necessarily reflect the official views of the Kaiser Permanente Community Benefit Funds. 23 Smith N, Iyer RL, Langer-Gould A , et al. Health plan administrative records versus birth certificate records: quality of race and ethnicity information in children. BMC Health Serv Res 2010; 10: 316 DOI: 10.1186/1472-6963-10-316. 36 Vasa RA, Anderson C, Marvin AR , et al. Mood disorders in mothers of children on the autism spectrum are associated with higher functioning autism. Autism Res Treat 2012; 2012: 435646 DOI: 10.1155/2012/435646. 40 Burstyn I, Wang X, Yasui Y, Sithole F, Zwaigenbaum L. Autism spectrum disorders and fetal hypoxia in a population-based cohort: accounting for missing exposures via Estimation-Maximization algorithm. BMC Med Res Methodol 2011; 11: 2 DOI: 10.1186/1471-2288-11-2.